The presence of children at home could be a disaster for your tablet. Can-can your child will solve your tablet into several pieces. Of course it does not you want it? 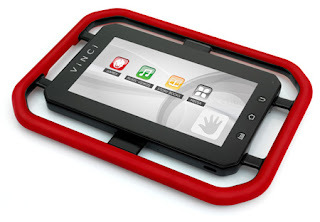 The solution is called VINCI Tab tablets. The tablet is resilient. The tablet is designed with a hard glass, with the tip of a smooth and easy to hold. So do not worry because this tablet will not easily fall from your hands. Moreover, this tablet also protect your children from Internet harm. Can you imagine, now children can easily surf ria and open sites that can adversely affect children. With WiFi and 3G connections are not too good, it seems that this tablet is the solution. The tablet has a 1GHz ARM Cortex A8 processor with 7 inch touch screen has a resolution 800x480p. The tablet is also backed Android operating system 2.3. Then, if you want sound or video, this tablet also supports it. These tablets are sold at a price of $ 400 or 3.5 million dollars and go on sale early August.